I’m getting ready to head out on the road with some fabulous — and some might say dangerous — ladies! 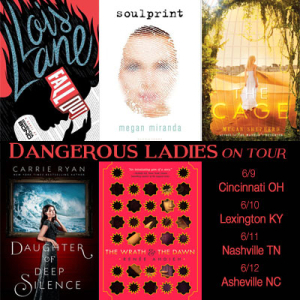 Next week I’m teaming up with Renee Ahdieh, Megan Shepherd, Megan Miranda, and Gwenda Bond for the Dangerous Ladies tour! We’ll be heading to Cincinnati, Lexington, Nashville, and Asheville so if you live nearby, come say hi and help us celebrate our latest books!